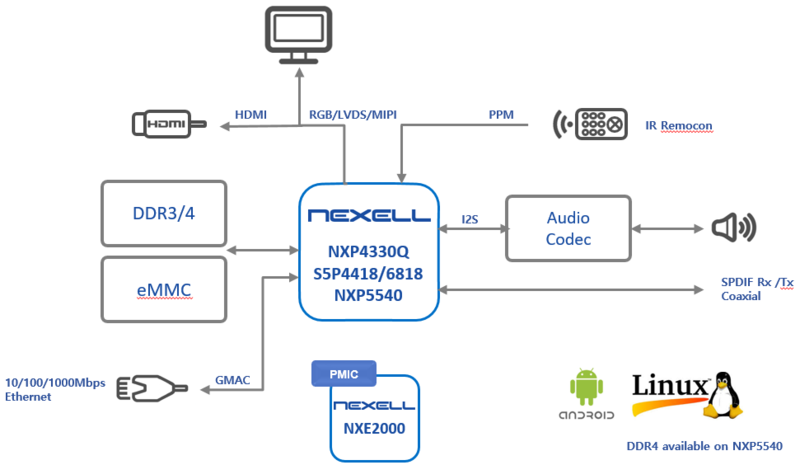 CONSUMERfrom IoT to 4K/8K UHD multimedia – Nexell Co.,LTD. Nexell's Consumer Lineup covers a wide range application from IoT which needs to support various connectivity, to 4K/8K UHD set-top box. In order to meet these various requirements, Various APs with various CPU configuration from Single Core based AP to 64bit Octa core based are provided. And the lineup is composed of APs including Full-HD/4K/8K UHD multimedia codec, light weight GPU or UHD class performance GPU developed by Nexell. In addition to this, the specialized MCU is built in for power management and general purpose, so the power consumption which is superior to the competitor is realized. By supporting the latest peripherals, it is possible to interface various external devices without glue logic, so the optimal BOM cost can be realized.